2013 seems to be the year of "pumpkin spice". Everything from coffee to Hershey's kisses, so I figured I would play this game too. Why not....everything in fall is better with pumpkin, right? Like pumpkin brownies, can't go wrong with pumpkin. Tis' the season! I have made pumpkin pancakes previously, with caramelized bananas, but this time I added oatmeal to make them a bit heartier, and for an added bonus I added some chocolate chips. This is basically my guarantee that Z will eat her breakfast. And who am I kidding, I like the chocolate too. They really taste more like a big cookies, but a bit healthier. They are also just as tasty sans chocolate chips. Stir in the chocolate chips if using. Heat a lightly oiled griddle or frying pan over medium high heat. Ladle the batter onto the griddle using approximately 1/4 cup for each pancake. Lightly brown on both sides and serve warm. You can keep the pancakes in the oven set at 150' while finishing the batch, or serve/eat as you cook. I like to serve with a dollop of Greek yogurt and a sprinkling of cinnamon, and a side of fruit. Now, you will be ready to take on the day! 'Tis the season of the pumpkin. The possibilities are endless...pumpkin pancakes, pumpkin soup, pumpkin pie, pumpkin crisp, pumpkin bread, pumpkin cookies, pumpkin pasta, pumpkin spice chai...... And the great part is that pumpkin is good for you too, so you can at least make yourself think....this dessert is ok, it has pumpkin in it. At least that is how I justify it, and I'm ok with that. With the changing leaves and cooler weather, the comforting flavor of pumpkin just feels right. 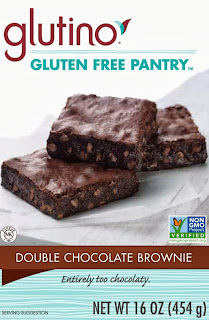 So, when Glutino sent me a box of their Gluten-free Pantry Brownie Mix, I knew what I had to do. I know I really should have made the brownies according to the directions to give proper feedback, so I cheated a bit. But, I have made their brownies before and loved them, so I thought I would dress them up a bit and give this box of brownie mix a fall makeover. It's so simple, I really don't even need to write a recipe. These brownies have only 2 ingredients in them! 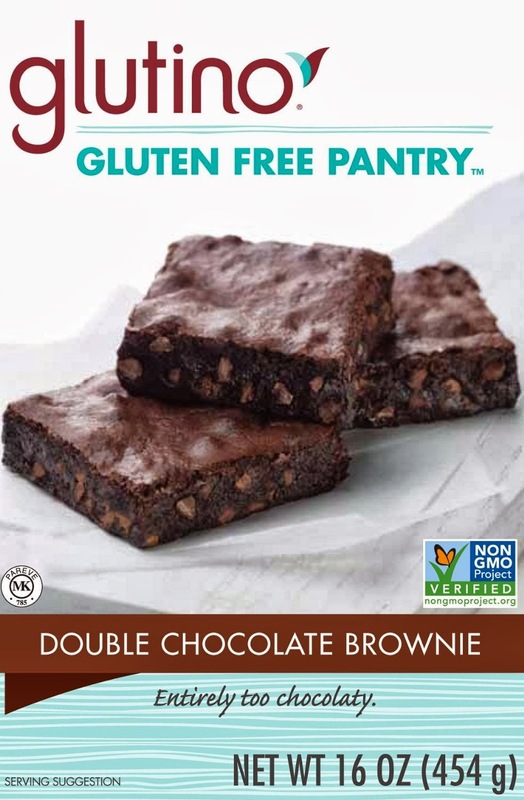 Yes, you read that correctly - 2 ingredients!!! In a mixing bowl, combine the brownie mix with the pumpkin until combined, and viola! That's it. It is really that easy! Let brownies sit for about 30 min, and then cut. The texture will be more fudge-like and less cakey, and it will be hard to eat just one...but hey, there is pumpkin in it...so go ahead have 5!